Energy Agent™ uses wireless technology to sense when doors and windows are open and automatically shut down heating or cooling. It does this silently, in the background saving property owners the headache of humidity damage repairs – and the loss of bottom line profit. Energy Agent™ is compact, simple and designed for long life and low maintenance. It fits in tight places, works with existing thermostats and wires in as standard system equipment. On-demand hot water heaters are more efficient by 20-40% than standard tanked water heaters. They are tankless which means they do not store water; they instantly heat it as it passes through, only using enough energy to get the job done. SKYE water heaters are designed for long life and high performance. On-demand water heaters are sediment-resistant in that they have no water storage tank minimizing any accumulation of sediment or heavy materials that can make water taste odd or appear discolored. SKYE tankless is perfect for MEXICO - Ordinary tank water heaters installed on the sea coast begin to rust within a few months of installation. If sediment is present in the water, it can accumulate to excess causing inefficient operation and progressively less hot water because heating elements are clogged with debris. Much more efficient than standard always-on tank water heaters. 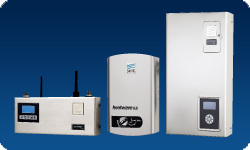 SKYE Tankless water heaters are computer controlled to use only the electricity required. eTEMP changes how guests treat your property by allowing you to set limits to how hot or cold the HVAC temperature can be set. As a matter of fact, it limits guests from changing anything except the preset temperature range and mode operation. eTEMP is well designed, easy to read, touch-screen and backlit. It’s also secure and can only be changed via service code access. 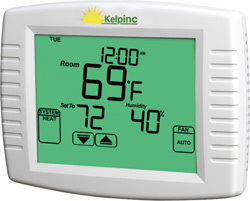 If you have an LG or TRANE AC system that was factory programmed to read Centigrade or to leave the fans running 24/7, (not really efficient for a rental property), Kelpinc can replace the existing control with a standard Honeywell thermostat or even the eTEMP control listed above.